In the mature ice cream and frozen desserts category — where sales increased only about 1% annually between 2010 and 2013, according to Packaged Facts — novelty is particularly important in driving sales (although new products sometimes cannibalize the sales of existing ones). Unilever Ice Cream will have no shortage of new offerings as the peak summer ice cream season approaches: It's rolling out 16 new frozen-treat products and varieties across its brands. The new twists include a special edition of Popsicles tying in with Disney's incredibly popular "Frozen" movie (shown), and a move to using "sustainably farmed" strawberries, coconuts, bananas and limes in all varieties of Fruttare frozen fruit bars. The Good Humor brand has a new logo and new packaging, as well as new products that include a Good Humor Girl Scouts Thin Mints bar, and (in the Northeast), new multipacks of its vanilla and chocolate King Cones and Chocolate Chip Cookie Sandwiches. Klondike is offering its first new stickless variety (Cookie Dough Swirl) since 2012, and a new Kandy Bar variety (Mint Fudge Cookie Bar). 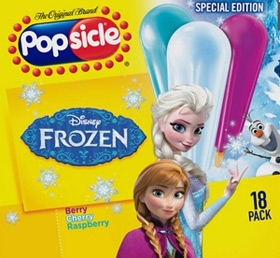 In addition to its "Frozen" edition, the Popsicle brand is launching two novelty lines: Popsicle Tootsie Pops and Popsicle Mystery Middles.